The future Internet will comprise not only millions of computing machines and software services but also billions of personal and professional devices, diminutive sensors and actuators, robots, and so on, and trillions of sentient, smart, and digitized objects. It is an overwhelmingly accepted fact that the fast-emerging and evolving Internet of Things (IoT) idea is definitely a strategic and highly impactful one to be decisively realized and passionately sustained with the smart adoption of the stateof-the-art information communication technology (ICT) infrastructures. Today, smart grid, smart homes, smart water networks, intelligent transportation, are infrastructure systems that connect our world more than we ever thought possible. The common vision of such systems is usually associated with one single concept, the internet of things (IoT), where through the use of sensors, the entire physical infrastructure is closely coupled with information and communication technologies; where intelligent monitoring and management can be achieved via the usage of networked embedded devices. Many potential connected things are located in remote or hard to reach areas, at long distances from the next cellular base station, or in shielded areas, such as deep within buildings or underground structures. When there is coverage, it is often poor and requires the device transmitter to operate at high power, draining the battery. Additionally, cellular networks are not optimized for applications that only transmit small amounts of infrequent data. Further, the existing cellular standards don’t support power saving capabilities, which makes these standards unsuitable for inexpensive devices that require battery lives of several years. Therefore, Low-Power Wide Area Network (LPWAN) technologies are suitable, targeting these emerging applications and markets. Cities: Tracking a city requires many aspects and so cost efficiency. NB-IoT make it possible to control street lighting, free parking spaces, environmental conditions, and so on. 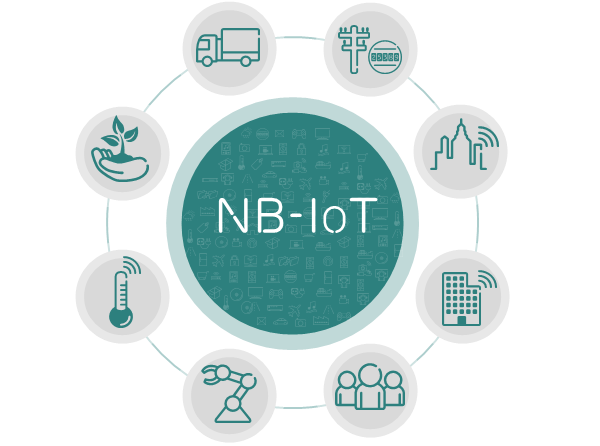 Buildings: NB-IoT can act as the support for the building broadband connection. Security will also be performed by connecting sensors directly to the monitoring system using LPWA networks. Consumers: NB IoT technology is able to support a massive amount of sensors, from heavy to low data activity. For consumers, wearables are the cornerstone of IoT. In the light of the above, Hemustech R&D department is already conducting research in the integration of NB IoT with other technologies within the need to build an IoT management platform that will carry out the aim of better governance, livelihood, and business, by building a smart world where all things are connected.